You may not have heard of Malcolm Cecil or Robert Margouleff but you’ll certainly be familiar with their work. These two electronic music boffins helped transform Little Stevie Wonder in to one of the greatest song writers in pop music. They produced and engineered four albums that are widely regarded as “Stevie’s classic period.” Four albums that featured his most enduring songs such as Living For the City, Superstition, Higher Ground and You Are the Sunshine of My Life. Stevie was at the height of his creative powers but Margouleff and Cecil were his sonic architects, steering him away from the bubble gum pop sound of Motown. Central to Margouleff and Cecil’s production style was their creation, TONTO. The Original New Timbral Orchestra was a huge, room-sized super-synthesiser developed with the express purpose of making this new, intimidating technology work together as a giant electronic ensemble. 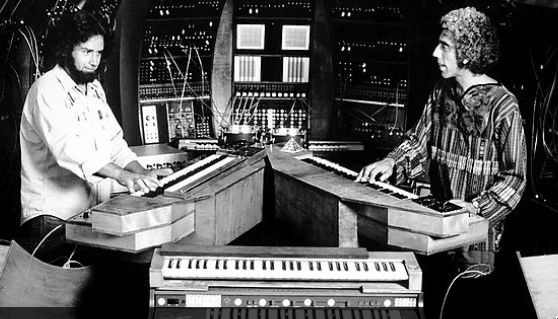 Margouleff and Cecil manipulated its futuristic controls, while Stevie played its keyboards. The results turned out to be timeless. Their pioneering electronic developments in sound and production proved hugely influential to black popular music in the 1970s. As well as Stevie Wonder, Margouleff and Cecil have worked with a whole host of big name artists such as The Isley Brothers, Gil Scott-Heron, George Harrison and Devo. So why have you never heard of them? Broadcaster and fan Stuart Maconie investigates their story and argues we should be celebrating these forgotten men of pop instead of consigning them to Rock ‘n’ Roll’s backroom staff. Contributors include Robert Margouleff, Malcolm Cecil, Pete Townshend, Michael Sembello, Steve Hillage and music historian Mark Sinker. Thanks for posting the BBC program. Stevie Wonder was such a public popular figure I never gave second thoughts to what might lie behind his sound though I figured it could not be “by natural means”. But then, for all I know, the Beatles for example did all the stuff on stage and you needed no outside explanations, yet still they also created their own “sound”. As a compliment to Cecil and Margouleff I would say that they did it so naturally I never ever began to question the setup until now.